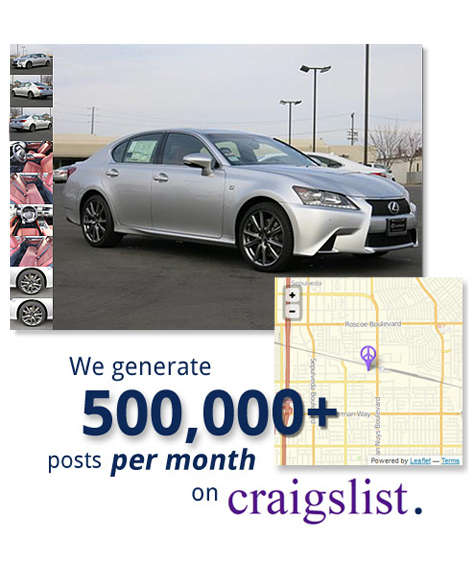 The auto posting utility in WebManager automatically sends your dealership’s vehicle listings straight to Craigslist. Instead of spending hours posting each vehicle into Craigslist, you could save time by allowing WebManager to do all the work for you. The process is as simple as selecting the inventory you would like to post and then proceed by clicking post. Craigslist has disallowed image-based templates that WebManager used to provide. However, we have made changes to WebManager that strictly follow Craigslist’s posting guidelines thus minimizing the worry of being flagged. WebManager’s Auto Posting feature has been updated to reflect the $5 per posting charge that Craigslist has added. With WebManager, payments for your postings are automated and can be set up within WebManager. Posting is automated through WebManager to help you save time. Listings are aesthetically pleasing and follow Craigslist’s new strict guidelines.